Biosceptre announced that has appointed Sir Gregory Winter as Chair of the Biosceptre Board of Directors. Sir Gregory has led the Scientific Advisory Board of Biosceptre for over 4 years and joined the Board of Directors as a non-executive director in May 2016. Sir Gregory Winter is Master of Trinity College Cambridge and was a past member of the Medical Research Council’s Laboratory of Molecular Biology (LMB), serving as both a Head of Division and as Deputy (and Acting) Director. Sir Gregory has developed technology to make humanized antibodies and human antibodies in bacteria. A number today's available therapeutic antibodies were developed using methods devised by Sir Gregory. Sir Gregory has unique biotechnology industry experience, being a Founder and Director of Cambridge Antibody Technology (acquired by AstraZeneca), of Domantis (acquired by GlaxoSmithkline) and currently of Bicycle Therapeutics Limited. Sir Gregory was elected a Fellow of the Royal Society (FRS) in 1990 and awarded the Royal Medal by the society in 2011 for his pioneering work in protein engineering and therapeutic monoclonal antibodies, and his contributions as an inventor and entrepreneur. He has also won several international awards including the King Faisal International Prize for Medicine, the Cancer Research Institute William B. Coley Award and the Canada Gairdner International Award. Sir Gregory was appointed Knight Bachelor in 2004. Our most recently published Executive Informational Overview (EIO) on Biosceptre International Ltd is available below for download. 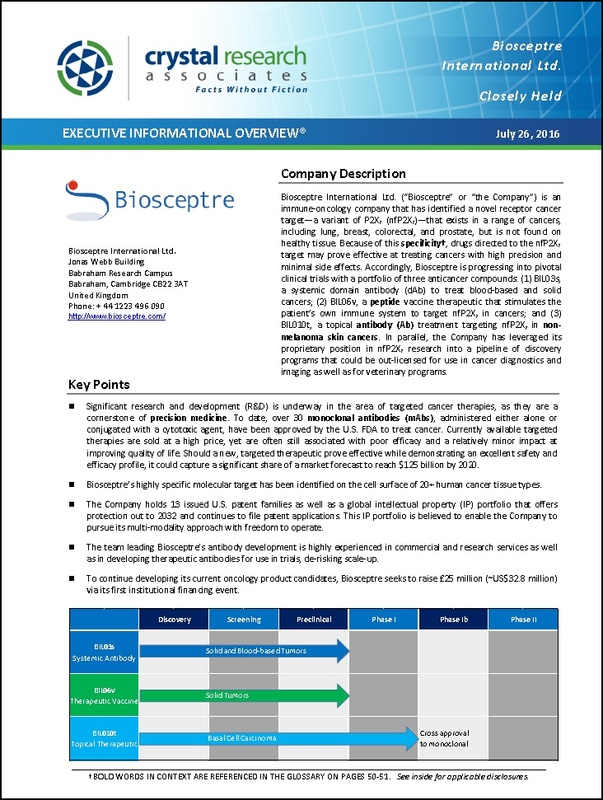 This a 52-page report details Biosceptre's business, novel technology and product development, market opportunities, competition, financials, risks, and more. Crystal Research Associates has recently released Executive Informational Overview (EIO) reports on both Ra Medical Systems, Inc., a profitable medical device company commercializing a new laser system for vascular diseases, and Biosceptre International Ltd., a development-stage immune-oncology company that has identified a new molecular target for cancer treatments. We have just published a new set of slides that summarize the key elements of each of these companies, from business and product overviews to market sizes and growth strategies.